Snuggle your toddler into this Princess Leia costume. The white romper is made of comfortable polyester and flannel. A vinyl belt with sewn accents and hair bun headpiece is also included. 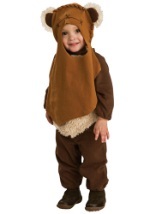 Your tot can look just like Princess Leia with this officially licensed Star Wars costume. Check out our other Star Wars toddler costumes to create a fun play group theme!